I stole this idea from our friend Ella's mommy and wanted to post some current Nate-isms before i forget them. Nate, at this stage, is somewhat of a solemn, serious little thing...particularly in new situations. he is not one to jump right in and play just yet. he has to get used to his surroundings, watch others, and then deem if it is okay to play or not. Both Karl and I were apparently shy kiddos (ha), so I am guessing we have a bit of a shy guy on our hands. in the comfort of the living room, he is a babbling, laughing mess. Nate is standing (forever at a time) and taking steps (like 3 or 4 steps). He has been cruising for months and months. He is a cautious little thing who wants to get it right. He was slow to roll, slow to crawl (and he STILL crawls like this; we get comments on it everywhere! ), and now a bit slow to walk. we aren't worried; we know he wants to (oh you can see it in his eyes! and he laughs and claps after every step he takes) and that he will TAKE OFF when he is ready. One thing he DOES work on is his vertical climb - so far he can scale all the couches and karl's papabearchair. He is also quite good at stairs. So, yea, that's not TERRIFYING or anything. Nate does have a decently large vocab. He says dog (and dear god does he LOVES our dogs. our poor, tortured dogs. ), duck, na-na (banana; everytime i ask him if wants a snack, he says NANA loud and clear... he doesn't always get one but i think it's cute that he associates snack and banana), mama, dada, ball, hi, um, cracker (weird, right? but pretty clear. ), yum (well, num num) and, occasionally, clock (though the jury is still out on that one. we show him a picture of a clock and he makes this weird sound like when you are hocking a loogy (oh, yea, i just referenced hocking. a. loogy. GROSS.) so we think it's clock, but, well, whatever. it is. (he is the smartest boy alive after all.) Also, when you hold up a hand held mirror in front of him and say "Who is that? ", he responds with a noise like "Nah." 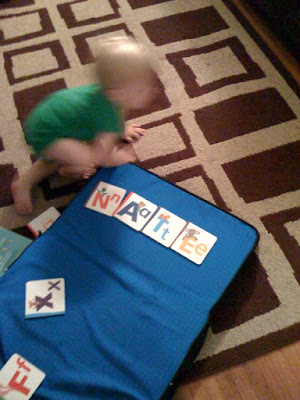 I think he is trying to say Nate, but Karl laughs at me. Nate is also starting to understand commands better - like 'give it to me' or 'put it down' or 'stand up' - still working on the ever-elusive "NO!" (oh, you know he understands it.) He also can point out his head, nose, toes and a few other body parts. He gives hugs and kisses (still open mouthed - working on that.) and will raise his arms up when you say "touchdown!" Nate still does not sleep as much as other babies his age. Yes, he sleeps through the night (and I am thankful for that), but napping? HA. He doesn't have an AM nap (unless he falls asleep in the stroller or in the car briefly). I put him down consistently at the same time every afternoon and the VERY MOST i get (if i am very, very lucky) is 2 hours. He goes down for the night anywhere between 7:30 and 8:30 (depending on the nap length) and sleeps through until about 6:30 in the a.m. I remember when we were concerned about his lack of napping at daycare/home and our pedi told us "some kids just don't need as much sleep as others." Yep, that some kid? It's my kid. (And, yes, I am furiously typing this as he naps.) Most days, I don't mind because he is happy and smiley and runs around like he is fueled with SLEEP. Some days, I wouldn't mind him sleeping a bit more so I could, you know, shower and blog (my reader is always full) and read or do whatever. i am sure his pattern will change as he grows, but that is where we are right now. Let's see. Nate eats everything we put in front of him. His current favs are edamame, MILK, yogurt, cheese, blueberries, watermelon, grapes, carrots (cooked and soft of course. ), corn, mushrooms, brocoli, pickles, black beans, oatmeal. (if he is not supposed to have any of those things, please do not tell me. cause he has.) Pretty much he will try everything we put in front of him (even olives - yuck.). He does NOT want you to feed him very often; he much prefers to do it himself. He hates sippys and will only drink out of a straw. He still (shhh) has a night time bottle of milk before bed. I know he is getting too old for it, but it's a time of day we cherish - he is so rarely still in our arms. (for the record, he weighs almost 25 pounds; and is a little over 31 inches tall.) (we think he is tall and skinny like his dad.) He also still takes a paci/binky at bedtime (and when he is sick) (and in emergency situations like, uh, airplanes where screaming children are frowned upon.). But he REALLY has moved past his whiney stage (i credit his budding communication skills! ), so he really doesn't miss the paci, so it remains a night time comfort for the time being. Nate is almost impossible to capture on film. See picture above. i'm probably going to read this post every day for a month. i love it that much. I LOOOOOVEEE this post. It makes me so happy. It makes me wish we lived in the same town so I could witness all of this myself. Give that adorable little guy a kiss for me! Love it - especially that he eats edamame, loves buttons and na-nas. Completely precious. I love this! I went to the video link and pretty much watched every single one of him :) He is sooo adorable, and I love it when he smiles and giggles! Do the robot room. Do it!! His crawl is fabulous. I've never seen anything like it! He's adorable. And can I just say I am so thankful to you for not using the little baby voice whilst recording? You sound like a regular person--I love it! Am I allowed to say that since I don't have kids? I saw some cute robot and space twin sheets somewhere online when I was searching pirate and cowboy ones. Hmmm...I'll try to remember where. I'm going to Pottery Barn in Memphis on the way home Fri. I'll call ya if there's something cute. Great post. You should print that and put it in a keepsake box or baby book or somewhere for him when he's older. Setler LOVES buttons. No button when un-pushed at the mall yesterday!